I usually make things from scratch, but sometimes that is not possible. 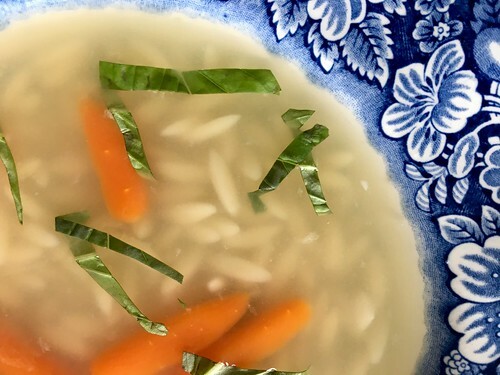 In the old days, before I had children, if I came down with a bad cold, I’d get a whole chicken and raw carrots and celery and all the ingredients to make chicken soup from scratch. Yes, I was nuts. These days, I have learned a new trick. I use ready-made ingredients for my Quick Get Well Soup. Bring the chicken stock to a simmer with water, Use the stock:water ratio from the instructions on container. Put on low and add the carrots. 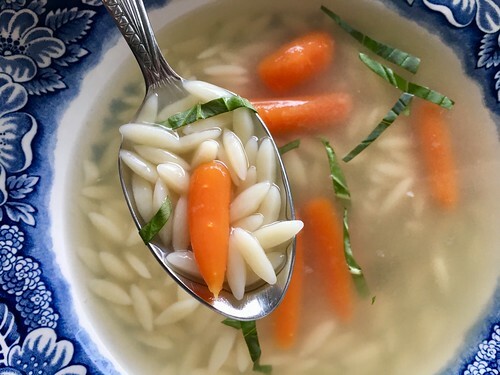 When ready to enjoy a bowl, ladle a portion into a bowl and stir in the freshly cooked orzo. Top with minced fresh herbs. That’s it! It is not the most amazing soup on earth, but when I have a cold it goes down easily and is soothing without all the additives and sodium of prepared soup mixes. This entry was posted in Lunch | Dinner and tagged soup. ← Happy Easter! Pesach Sameach!